Collecting movie memorabilia has grown into a huge business, with fans eager to pay top dollar for some of the rarest movie props out there. One of the best places to find some of these rare props is a place known as Prop Store L.A., which is run by Brandon Alinger, who invited Star Wars icon Mark Hamill to visit his shop in a new episode of Pop Culture Quest, debuting on Comic-Con HQ Tuesday, January 17. A video has debuted that shows Brandon Alinger reuniting Mark Hamill with a very special prop from Return of the Jedi. 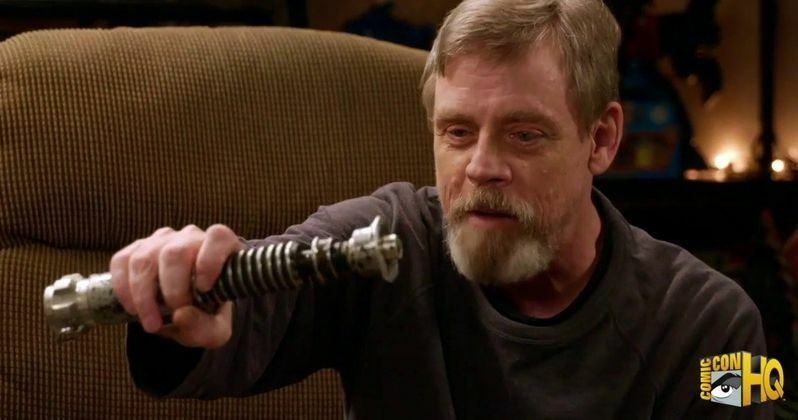 The clip, which comes courtesy of Geek Tyrant, shows Brandon Alinger pulling out a special prop from his personal collection, the real lightsaber Mark Hamill used in Return of the Jedi. Brandon Alinger also has quite a story behind the prop, revealing that this same lightsaber was used by Alec Guinness in A New Hope as his "special effects lightsaber." He also reveals that there was a motor inside the prop that spun the blades, which were made from the same reflective material used to make movie screens. Here's what Mark Hamill had to say about how he used this prop during Return of the Jedi. "It was movie screen material, because that reflects the light source back at hundreds of times the intensity. You had a wire up your sleeve and a battery pack on your back. You'd go like this and freeze, and they'd run in and put that pole you're talking about on it, and then run out, just like how they did the effects on I Dream of Jeannie." The synopsis for this episode, entitled Raider of the Lost Props, reveals that Brandon Alinger literally went to great lengths to obtain some of these props. There was a time before the internet where collecting required a boots-on-ground approach. Collector Brandon Alinger took this phase to the next level when he convinced his family to travel to Tunisia in search of movie props. Follow along as Brandon explains the extreme lengths he's gone to obtain some of the most notable movie props in the history of Hollywood Cinema. While Return of the Jedi wasn't shot in Tunisia, the country was used for the scenes set on the desert planet of Tatooine in A New Hope. Mark Hamill's Pop Culture Quest debuted November 15 on Comic-Con HQ, with the series kicking off at the DC Comics headquarters with the legendary Jim Lee, as the co-publisher and Mark trade favors and end up with their very own pieces of pop culture history. Throughout the season, Mark Hamill's Pop Culture Quest uncovers comic book memorabilia, film props, Godzilla, pinball machines and beyond with special guests including monster amasser Scott Zilllner, famous collector Bob Burns and many more! Hamill will once again team with his friend and Return of the Jedi producer Howard Kazanjian. Kazanjian was Executive Producer on Raiders of the Lost Ark and served as VP at Lucasfilm during the dramatic expansion of the company in the 1980s. Take a look at this new clip from next week's episode of Mark Hamill's Pop Culture Quest.